Following RT anchor Liz Wahl’s dramatic on-air resignation this week, editor in chief Margaret Simonyan dismissed criticism of the network as a “Kremlin propaganda mouthpiece” in an essay, claiming that Western news outlets are just bullying RT journalists for “showing everybody the other side of the story.” “We’ve got a genuine war going on — no, thank God, it’s not in the Crimea. It’s a media war,” she writes. And there’s one legendary suspender-wearing figure caught in the middle. 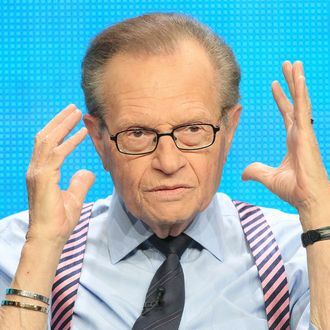 Facing criticism for his association with RT, Larry King distanced himself from the network in an interview with the Daily Beast on Thursday. Though the 81-year-old former CNN host has two broadcasts, Larry King Now and Politicking, which appear on the network, he says “I don’t work for RT.” The podcasts are licensed to RT America by the company Ora TV, in which King has an equity stake. Nevertheless, the Daily Beast notes that King participates in the network’s ads and is promoted as one of its “signature” personalities. While King has declared his neutrality when it comes to RT, sadly there’s another beloved anchor being dragged into the larger clash between Russia and Western media outlets. A report in Page Six claims Bob Costas’s bout of Olympic pink eye was caused by botched Botox. A NBC Sports spokesperson insisted to the Post, “This has zero truth to this. Zero,” and we refuse to believe this is anything more than #SochiProblems retaliation.